“Liuteria Lodi” was born in the first years 70′ from two brothers, Leandro and Maurizio. Sons of a builder and renovator of furniture, they learned the art of the wood workmanship attending the shop of their father in the after-school. Leandro, the old one, showed well soon great manual ability as well as a strong predisposition in the artistic expression, deepened thanks to the frequentation of the Venturi institute of art. Maurizio enrolled in the desk of guitar of the Teacher Saldarelli in conservatory of Modena, cultivating his passion for the music for 5 years. 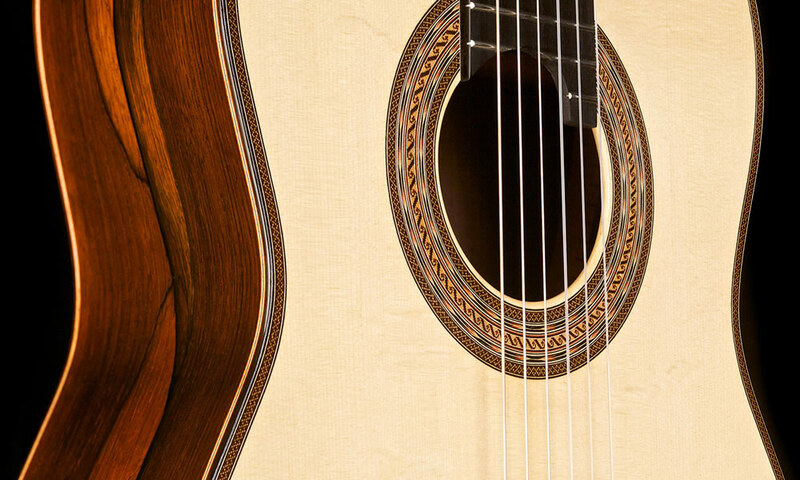 The common desire among the two to venture in the construction of the guitar, brought soon to the creation of some tools inspired to the most authoritative builders whose works were available in the conservatory. 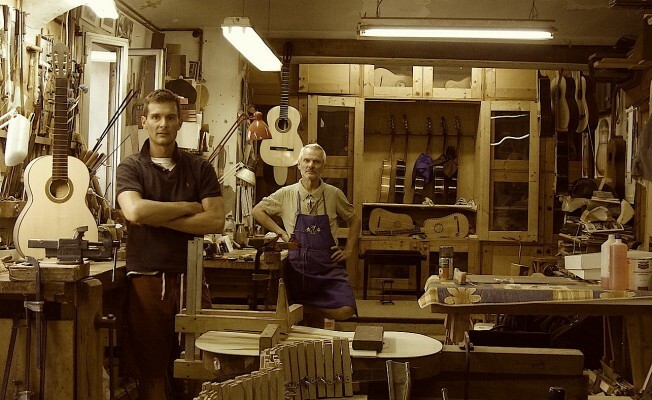 Such tools were produced in the workshop of their father, but soon they had the opportunity to open an independent workshop for the construction of classical guitars, using as model of reference the project of José Ramirez III, famous and appreciated in that period in the environment of the classical guitar in Italy. Around 1975, the knowledge and the frequentation with Alan Wilcox, a famous guitar maker near Florence, was a great and important footstep that allowed the two to understand the world of the guitar makers and the finality of the job, detaching definitely themselves from the handcraft job. Thanks to the a good relationship established, Maurizio and Leandro kept on attending Teacher Wilcox’s workshop for some years. In the decade among 1980 and 90′, the production of classical guitars on the model Ramirez III subsequently improved thanks to the always present support of teachers and guitarists that attended the workshop. In that period, the two brothers produced a good series of guitars of beautiful invoice with materials and woods of great merit. The appreciations from the musical world didn’t delay to arrive! In the 90′, the acquisition of new sources of inspiration and the constant close examination of the technique of construction, brought a period of introspection and study, with the finality to the improvement of the sonorous result of the guitar. In this period Leandro and Maurizio rediscover the Spanish historical classical guitar and its great heads-school. The possibility to reconsider their own job in a new perspective was without doubt a big source of inspiration and stimulus. The attempt to recall Torres models through documents and “planimetrie”, was the first footstep in a well defined direction that brought soon to the study of the constructive methodology on original historical guitars. The possibility to use such unique tools as source of learning and inspiration, has constituted a moment of fundamental growth. In these years Leandro, not able to develop the activity of guitar maker contemporarily anymore to that of renovator (cause of evident reasons of time), had to entirely devote himself to the activity of renovator cabinetmaker for which he is known in our town. It doesn’t have ever stopped attending the workshop, fed by a great passion: its interventions and suggestions continue to be essential and fortunately, they don’t miss today! Maurizio used the help of his child Gabriele, that showed particular interest for the music more and more and, particularly, for the guitar. The apprenticeship of Gabriele with Uncle Leandro determined his formation and allowed the workshop to continue in the construction to 4 hands of the tools. The different attitudes of Maurizio and Gabriele perfectly insert and the comparison in the planning and in the assemblage is often important for the growth and for a good result. Maurizio and Gabriele continued studing and searching on original tools and they deepen the knowledge with musicians that more and more will be shown to establish a narrow relationship with our workshop. The direct purchase of important historical guitars going up again to the romantic and modern period, present now in the workshop and of which Maurizio and Gabriele have taken care of the restauration, has opened a new road to the job, finding the trust of guitarists and collectors that always more submit their tools for the restauration. The first occupation remains, however, the construction of classical guitars. In the last years Gabriele is devoted a lot to the promotion of the job performed in the shop, in national and international fairs, proposing the tools to a vast foreign market more and more. The production, made of small but important numbers, is appreciated today and known thanks to the wish to make known the tradition of “Liuteria Lodi” to everyone searching of a particular and special tool. Contacts and relationships with Japan, Korea of the North, Canada, U.S.To., Australia and in Europe derive from this appointment. “Today is of fundamental importance and interest for the “Liuteria F.lli Lodi”(Lodi Brothers) the relationship with the musicians guitarists that frequents the workshop, with which we keep on seeking the musical meaning more truth and concrete of the guitar, also considering the relationship with the other musical tools. We believe that is necessary the study and the understanding of the past to be able to act with great correctness in our job today”.